Chicken soup sounds good but with the addition of fresh ginger, chicken soup stands out. Add some papaya and this tangy soup is elevated to ambrosial status. If you have papayas, make this soup and inspire smiles at the table. 1 pound (about) firm papaya, peeled, seeded and cubed into 1 inch pieces. Starting a meal with a bowl of soup is a good idea. For one thing, it can prevent overeating and is rich in nutrients. This ginger chicken and papaya soup could even be the whole meal along with a green salad and some bread. Now chicken I know and the chicken there looks really good. this sounds awesome--i love the flavor of ginger in soups!! Oh this sounds so good. I have to confess, that when I find a yummy recipes in my A to Z Challenge I'm copying them to a neat little recipe file I have hidden on my computer. Thanks for checking out my 'G for girls' post. This looks sooooo good. Yumm. We don't get papayas much here but come summer we get more. The ginger would give it zip. hmmm chicken and papaya? I have never heard of this but it sounds yummers! Anthony, I love ginger chicken soup. In fact we are growing some ginger on our balcony! But I will have to try adding papaya - never done that before! Papaya and ginger are two of my favorite ingredients. I don't know where you find so many yummy recipes, but I'm sure glad that you do. Thanks again. My kids would love this soup as they go for ginger and papaya. Looks nutritious too. I have never thought to put papaya in soup. I'm going to have to try this. Thanks for sharing! Sounds like an interesting recipe. I'd have never thought of putting papayas in a soup with chicken. I'm just not to sure that my guys would eat this. Happy Easter to you and Kathy! PAT HATT: Thanks Pat, it's good. LYNN PROCTOR: We love ginger in many ways. KATHY: Hidden in your computer? Wow. Enjoyed the girls post. MANZANITA: Glad you like this and hope you get papayas to try it. DUNCAN D HORNE: Growing on your balcony, how good is that, we use it a lot. GENE POOLE DIVA: Thank You Gene. STEPHEN TREMP: Yours and everybody's children and their parents would love this soup. THE FRECKLED SISTER: Papaya looks and tastes good in this soup. SUSANNE DRAZIC: Your guys should have the opportunity to try this. In the unlikely event that they don't you could remove the papaya. I love that you're doing soups! Ginger makes everything better! This sounds delicious. What did you guys have for Easter dinner? MELANIE: Thank You, I appreciate your interest. Hope you had a Happy Easter. 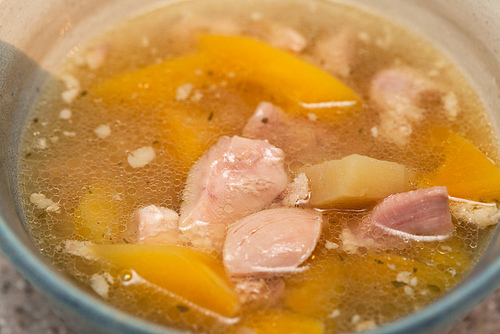 CHATON: Ginger chicken soup with papaya is delicious. Chaton, I hope you and your family had a Happy Easter and a nice meal. I'm not a big fan of papaya but I might substitute it for something else because the rest of the dish sounds YUM! I love soup and this one sounds delicious! Thanks for the inspiration to cook! KATE O'MARA: Thank You for visiting. LYNDA R YOUNG: Please feel free to substitute or just omit papaya if you do not favour it. AURORA CELESTE: Welcome soup lover hope you return.